FMC is a leading producer of training conferences for the TV, video and film industries. FMC partners with the National Association of Broadcasters (NAB), Adobe, Apple, Blackmagic, Avid, Dell and NewBay Media to produce and deliver cutting-edge training for production and post-production professionals. Our attendees are skilled professionals working for known organizations such as HBO, National Geographic Channel, PG&E, Google, HGTV, CNN, and Lockheed Martin, to name just a few. FMC is an authorized training partner for Adobe®, Apple®, Autodesk®, Avid®, NewTek®, Blackmagic Design, and BorisFX. The Editors Retreat is an event designed to help editors deal with the landscape of what’s going on today – and tomorrow. It’s a mix of creative, business and technical sessions. It is agnostic to your editorial platform with a mixture of topic experts, peer speakers and impressive keynotes with decades of experience in film & TV editing. 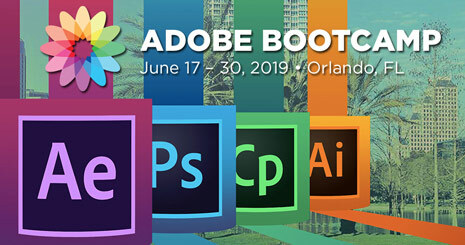 Adobe Bootcamp is an event designed to help you advance your skills fast. The schedule was built to accommodate multi-level, back-to-back training for the Adobe application of your choice within a short time frame. The event spans the course of two weeks, however, you will only attend the classes that match your interest and training needs. Students traveling from out of the area may contact the Orlando training facility to determine if they qualify for lodging. Please call 407.354.4866 for details. Missed the 2018 event? Stay tuned for the announcement of the 2019 dates and join us for another 3-day training event packed with more great training sessions, speakers, and social activities. The Keyframes Conference is a 3-day training event in multiple tracks, geared for content creators who wish to maximize their efficiency and creativity in motion design and visual effects. This event is where motion designers, animators, VFX artists, and filmmakers come together to benchmark the best practices, discuss the craft and network. Join us for a six-day program designed for content creators and designers including TV, film and video editors, producers, directors, graphic artists, motion graphics designers and new media specialists. Choose from over 200 sessions on video editing, motion graphics, cinematography, VR, creative business, and much more. Produced by FMC, in partnership with Dell and Adobe, DELLiVR is a one-of-a-kind event designed to provide the ultimate, practical, hands-on training for production and post-production professionals on how to create compelling 360/VR/AR content. FMC in partnership with Adobe will organize a new edition of After Effects World. 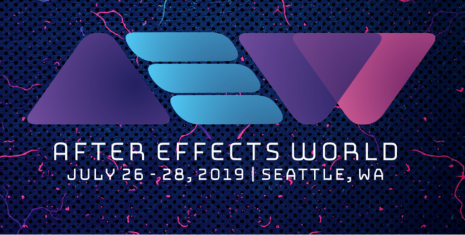 The event will take place at Adobe's HQ in Seattle and it is designed for post-production professionals who want to master Adobe After Effects.